For these types of assets, the designated beneficiary or the survivor joint tenant will take 100 percent ownership of the entire asset upon your death. These assets, while they are includable in the taxable estate, are not a part of the probate estate and are not a part of the administration process. However, if the joint holder or designated beneficiary predeceases you, or does not survive for 120 hours after your death, then the asset will become part of your probate estate and pass according to the laws of intestacy. That leaves all the assets held in the your name alone. What happens to those assets depends on familial relationships. The most common questions concern what happens if you have a spouse and children who are not also the children of your spouse (I.e. you have children from a prior marriage). If you have a spouse and children when you die, and any of those children are not also the children of your surviving spouse, your surviving spouse will inherit the first twenty-five percent of your assets (but not less than $50,000.00 nor more than $200,000.00), plus one-half of any balance of the estate. And your children will divide the remaining assets equally. The law provides for other conceivable scenarios, for example: If you die with children but no spouse, the children will share equally all your assets, and if a child has predeceased you, their share will go to their children. If you die with no no spouse, children or grandchildren, then your parents will receive your assets, if no parent survives you, your brothers and sisters will take equally. If you have no spouse, children, grandchildren parents or siblings, your property may go to more distant relatives, then to stepchildren, or if no relatives can be located, your assets will be given to the State of New Jersey. 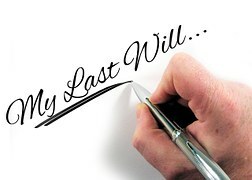 As you can see, it is important to have a will, and by doing so you can decide who inherits your assets, and ensure that your estate does not end up going to the State. You can contact the New Jersey Estate Planning attorneys at McLaughlin & Nardi, LLC by telephone at (973) 890-0004 or e-mail if you are interested in an estate planning consultation.